About 8 years ago Peter Turvey took some old rock concert tickets and albums into a local framer. He wanted the concert tickets to be framed with the album covers and vinyls. Once on display in Peter and Jo’s Eastbourne flat, the framing created huge interest among family and friends, planting the seed of an idea: perhaps here’s a potential business concept. It took another six years before that finally translated into action, with Peter searching the internet for opportunities to learn how to frame. Peter and Jo Turvey attended a DIY Framing training weekend in Maidstone. After that they practised framing at home for approximately a year before opening as a business. This time allowed Peter to test framing ideas on family and friends first. He had had a shop in Alderley Edge, prior to this (nothing to do with framing), so he did have experience in running a small business. Peter’s passion is music and the USP at Freebird Framing is framing vinyl records. 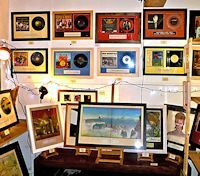 The look and feel of the Turvey’s gallery / workshop is centred on the framing of music memorabilia including all Peter’s own, old concert tickets from the 1970s. This creates an automatic connection with many of their customers, sparking interesting conversations with people, who attended the same concerts (over 30 years ago), or about music in general. Peter & Jo also cater for bespoke framing (mainly prints, photos and paintings), allowing them to have more than one product line generating income. Approximately 60% of turnover is in products for sale: the remaining 40% being general framing. About half of the “products for sale” figure consists of vinyl framing to order, rather than stock items sold directly from the “shop floor”. 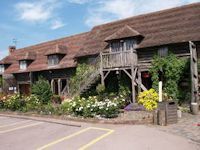 Freebird framing is based in a small craft unit at the Jinney Ring Craft Centre at Hanbury, near Bromsgrove. Like a lot of things in business, chance played a part in finding the Jinney Ring Craft Centre. Framing takes place in the unit, where there is also room to display the framed vinyl. Space is an issue, especially in terms of storing and cutting the moulding. This means that sawing is often done at home. Peter still uses a LOGAN Pro Saw and mount cutter; although this is very much the starter level equipment, he has found it more than adequate for current business needs. With the help of a mitre trimmer, and attention to detail, he produces professional, quality frames. This is more time consuming, but the business philosophy is based on unique, individualised pieces not high turnover framing, and the process feels more creative, less corporate. Developing your business presence is never easy. Peter is writing a marketing plan this year, which will include key elements of the marketing mix. Up to now they have relied on the natural footfall of the Jinney Ring Craft Centre, word of mouth and newsletters sent to their growing mailing list. Their website (www.freebirdframing.co.uk) has not been heavily promoted yet: exploiting the huge potential for on-line sales will be part of the 2013 marketing plan. The big launch last year was also primarily via a mailshot to existing contacts, family and friends, and then attracting the footfall on the day. In essence it was fairly low key: the reason being that, as relatively inexperienced framers, they wanted demand to reflect, realistically, their experience as framers. So a slow start, although financially not ideal, meant they could take time over orders, making sure of accurate completion to customer requirements. Peter and Jo are now in a position to compare year on year figures, which show the business is moving in the right direction. Implementation of their 2013 marketing plan will help the business continue to grow. That first order, Peter reflects, was, “Brilliant and a relief!!”. So, what recommendations do the Turveys have for anyone starting out? Don’t expect to make significant profits in the first few years. In the first year Peter also worked part-time for Worcestershire County Council - it is important to have an additional income stream to take the pressure off the business and allow it time to grow. Be prepared to make mistakes but never pass on anything to a customer that you are not happy with. Seek help from an expert if you need it. Enjoy the creative process. Framing is much more than just making a frame – it’s about bringing something to life – it’s about choosing the right moulding, the right mount colour, the right boarder size and many other factors. This is what transforms a photo, print etc into something that looks amazing and I find this process really rewarding. Don’t try and offer too many framing options too soon. We have spent the first two years perfecting our craft for making ‘standard’ frames. Building our expertise for framing other options – for example – football shirts will be developed in the near future. And what would Peter change? Peter views the experience of running their own business as a continual learning curve – both the good and bad parts. This whole experience moves them ever closer to the desired destination of running a successful business, allowing Peter to combine his passion for music with his innate need to be creative. Making large amounts of money isn’t the objective. Satisfaction and enjoyment are the main aims. If the profit margin allows them to live the life they desire then the journey is complete.